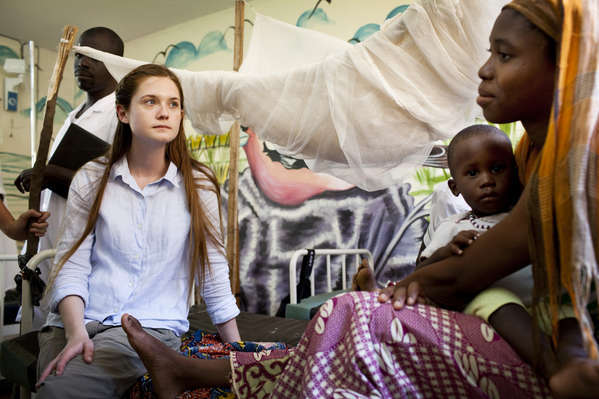 Bonnie Wright went to Senegal in West Africa last month to show awareness for the food crisis in the Sahel region of the continent as part of her ambassadorship with Oxfam UK. The organisation released a feature on Bonnie's tour of the area, where she spoke to local people suffering through making ends meet and trying to get enough food for their family; she also discussed the issue with UK's Sky News and the Independent - highlights of the Harry Potter actress can be seen below. Bonnie Wright: This was the first trip I had ever done of this kind. We arrived at the health centre first – five doctors to look after 200,000 patients. It was quite overwhelming, as I saw people really far down the stages of malnutrition. I met a young mother, Fatoumala Fofana, who was my age, with three children. Two of her children were with her, and while they are both about a year old, they looked so, so young. One child, Dihassan, was severely malnourished. He was so gaunt, his skin completely scabbing over, and he looked almost like a corpse. His mother was telling me how she had lost so much weight too and had another child at home. They had travelled four hours to get to the health centre – you can't even bring yourself to understand what it's like. "The mothers all knew what would help their children break out of poverty: education. They see it as the only way to empower their children and help them find work that is more stable than farming in the village. All the people I spoke to were so incredibly dignified, upbeat and hopeful. One woman, Fatima Diallo, 20, with five children, was receiving Oxfam's cash transfers of about $80 to last a few months. She had no other form of income and said she split it three ways: one part for food, one for health and for education. It has provided stability for her family. I think it's amazing that Bonnie is a part of this program. These people are so inspiring with their hope and humanity in the face of malnutrition. Bonnie is one awesome woman! I love that she is involved in this! Its just amazing that Bonnie's gotten involved with this because sice her involvement people seem a lot more aware of this stuff! Keep up the good work Bonnie!! I signed the petition she asked us to sign on her twitter. I think it's amazing what she's doing. Amazing. I am in awe of Bonnie using her voice to let others know that there is a need and we all need to end hunger. As a Bonnie fan, I am always in awe of her attention to such a program and making a difference. One thing to give money, another to go out and meet those who live it and share their voice with those who will listen, Well done Bonnie! I signed the petition she posted on twitter. I'm glad the news of the food crisis is getting spread. That's nice and kid of her to join such program. It wonderful to see her using her celebrity for giving her time and philantropic side to a great organization. Bonnie's so great and inspiring for doing this. Those people in Africa really do go through tough times that we take for granted.